The Beta-Barium-Borate crystal is a nonlinear optical crystal which combines a number of important features. These features include wide transparency and phase matching ranges, and large nonlinear coefficient. These features make it good for use in our experiments . 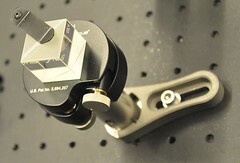 The crystal is cut for type-I downconversion and is used to produce a pair of down-conversion photons. The directions taken by these photons are complimentary and are determined by the angle formed by the optic axis and propagation direction of the incoming, or pump, beam . A beam splitter is an optical device that splits a beam of light in two. It is the crucial part of most interferometers. In our experiments we will be using Beam Splitter Cubes. These cubes are made of two triangular glass prisms, which are glued together with some transparent resin or cement. Polarizing Beam Splitters split the incident beam into two beams of differing polarization. For an ideal polarizing beam splitter both of these sides would be fully polarized. In practice only one of the two output beams is full polarized in the polarizing beam-splitter. The other beam contains a mixture of polarization states. This is the situation in our experiments. These were used for the construction of the interferometer. These beamsplitters allow 50% of the light through and reflect the other 50% without tagging the beams with any distinct polarization. We chose non-polarizing beamsplitters so that we could perform the initial interference experiments without having the "detag" the paths. When performing the quantum eraser experiment we could simply insert a half wave-plate into each arm in order to "tag" the paths. A collimated beam of light is a beam that has a low beam divergence, so that the beam radius does not undergo significant changes within moderate propagation distances. 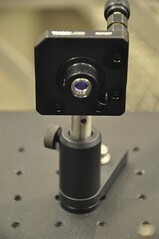 Collimated beams are very useful in laboratory setups, because the beam radius stays approximately constant, so that the distances between optical components may be easily varied without applying extra optics, and excessive beam radii are avoided. 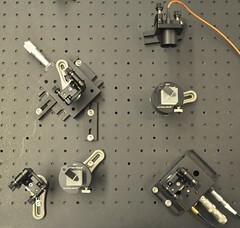 Most solid-state lasers naturally emit collimated beams; a flat output coupler enforces flat wave fronts at the output, and the beam waist is usually large enough to avoid excessive divergence. Laser diodes, however, emit strongly diverging beams, and are therefore often equipped with collimation optics – at least with a fast axis collimator, largely reducing the strong divergence in the “fast” direction. Focuses the beam into the fiber optic cable. Used to collimate the incoming signal. 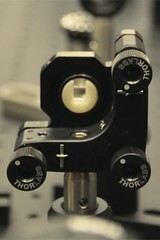 These lenses are labeled with "D" on the diagram of parts found on the detection system page. We used two types of fiber optic cables. One type was orange and was used for all connections previous to the filters . The second type was black and was better shielded against outside light. The black cables were used for all connections after the filters. These cables are labeled with "F" on the diagram of parts found on the detection system page. These filter out all light except for that in the infrared part of the spectrum. 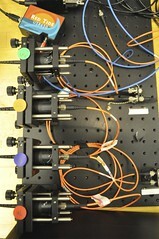 The filters are the last part of the optics chain before the SPCM. These filters are labeled with "W" on the diagram of parts found on the detection system page. A wave plate is an optical device that alters the polarization state of a light wave traveling through it. A wave plate works by shifting the phase of the light wave between two perpendicular polarization components. A typical wave plate is simply a birefrigent crystal with a carefully chosen thickness used to manipulate the polarization of a light beam. Birefringence, or double refraction, is the breakup of a ray of light into two rays. This can only occur if the material is structurally anisotropic, which means directionally dependent. A wave plate has a slow axis and a fast axis, both being perpendicular to the surface and the beam direction, and also to each other. The phase velocity of light is slightly higher for polarization along the fast axis. In a half-wave plate (λ/2 plate), which is what we are using in our experiments, the difference of phase delay between the two linear polarization directions is π. A half-wave plate retards one polarization by half a wavelength, or 180 degrees. 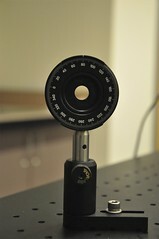 This type of wave plate rotates the polarization direction of linear polarized light. Interferometry makes use of the principle of superposition to combine separate waves together in a way that will cause the result of their combination to have some meaningful property that is diagnostic of the original state of the waves. An interferometer is an optical device that utilizes the effect of interference. Typically, it starts with some input beam, splits it into two separate beams with some kind of beam splitter and recombines the beams on another beam splitter. Each of these beams will travel a different path before they are recombined at a detector. The difference in the distance traveled by each beam creates a phase difference between them. It is this introduced phase difference that creates the interference pattern between the initially identical waves. If they meet in phase there will be constructive interference. Conversely, if they meet out of phase there will be destructive interference. The phase difference serves as a way to diagnose anything that changes the phase along the paths. This could be a physical change in the path length itself or a change in the refractive index along the path. In our experiments we will make use of what is known as a Mach–Zehnder Interferometer. The Mach–Zehnder interferometer was developed by the physicists Ludwig Mach and Ludwig Zehnder. It uses two separate beam splitters to split and recombine the beams. 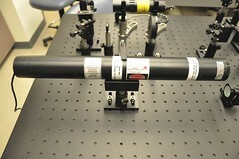 The optical path lengths in the two arms must be nearly identical, within the coherence length of the laser, in order to see interference. 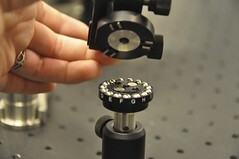 A mechanical device that allows for a range of apertures. 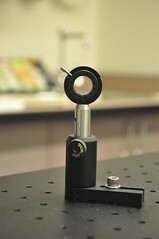 This allows us to focus the laser at increasing levels of accuracy, as we use smaller apertures. To turn on the diode laser, first press the red power button. Then turn the key clockwise. Then press the on button twice until the light goes green. Invert this order to turn it off. The light coming from the diode laser is similar to the HeNe light. 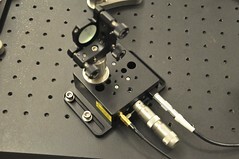 This laser is a semiconductor solid-state laser. 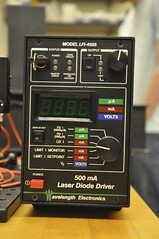 The laser diode emits a wavelength of 405 nm. 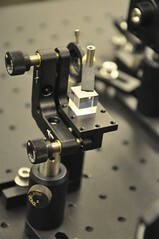 Light from this is down converted at the BBO crystal to create photon pairs of wavelength of 810 nm. 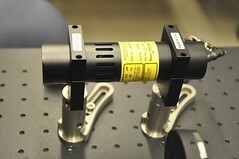 The high frequency of this laser light results in an infrared frequency after the BBO. These goggles filter a large amount of light near the frequency emitted by the 405nm laser. This can be useful when trying to align specific parts of the beam, as the beam hitting a surface will appear as a dot (similar to the HeNe to bare eyes) as opposed to a large, bright smear from all of the scattering. 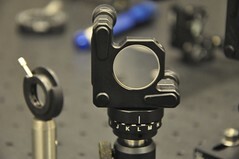 The goggles can also be useful to use at the computer if the computer is set up at beam height and downstream of the beam. Take care when using the goggles to not forget whether or not the beam is on - direct eye contact can still pose a threat. These mounts allowed us to remove the mirrors without having the re-adjust and re-setup the positioning. This mirror was used for all parts of the experiment except for the interferometer. This mirror reflects all light. 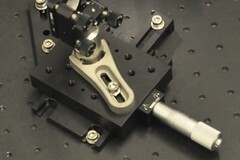 This stage has only a manual adjustment, which was used to make coarse adjustments to the path length of one arm. This stage has both a manual and electronic adjustment. This was the stage used to make fine adjustments in order to make path lengths of the interferometer equal. 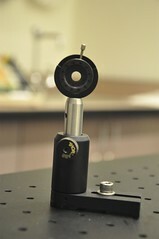 The electronic adjustment can make adjustments as small as 1 micrometer. 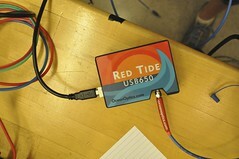 We used a RedTide Spectrometer. It is ideal as a general-purpose instrument being budget-conscious. The Red Tide has a wavelength range of 350-1000 nm. 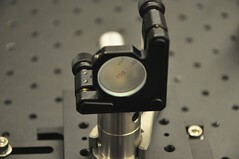 It can calculate one data point per nanometer .